Solemnity surrounds the recitation of the ancient Aramaic prayer known as Kol Nidre. Yet its stirring effect on Jews worldwide is undeniable. 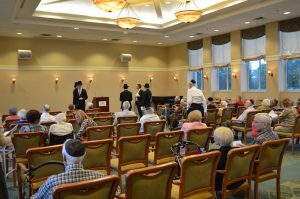 How emotional the prayer can be could be seen in the Kol Nidre service held recently at North Oaks Senior Community in Pikesville, Maryland. 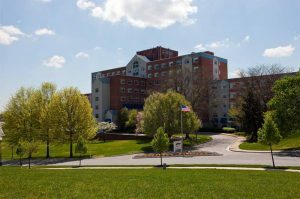 North Oaks opened in 1990 and offers independent living apartments with access to assisted living, skilled nursing care and rehabilitation services. At its heart, North Oaks is an interactive community – in tune with the spiritual needs of each resident. 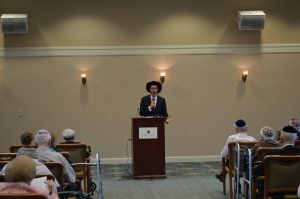 Sherrie Polsky – Community Life Services Director at North Oaks – told me during a brief pre-visit phone interview that the facility has long offered an array of religious options for its mostly Jewish population. Unlike the confessional Ashamnu prayer most associate with Yom Kippur, Kol Nidre is a technical prayer – a petition annulling any and all vows which may be problematic. Some hold that the importance of the prayer dates to the Spanish Inquisition when forced conversions put Jews at odds with their hidden faith. But the prayer itself preceded the Inquisition by at least 500 years. Is the prayer prophetic or rooted in some lost episode? “According to Kabbalah, Kol Nidre is more than a technical vow-annulment procedure. Rather, by releasing our vows we are asking G-d to reciprocate in kind. In the event that He has pledged not to bring the redemption just yet, in the event that He made an oath to bring harsh judgments on His people in the following year, we ask that He release these vows and instead grant us a year of happiness and redemption. I arrived at North Oaks at 5:00 P.M last Friday — the eve of Yom Kippur. Once inside, I found my way to Wilson Hall, where I was greeted by a congenial man named Sol Fisher. Fisher has been a resident of North Oaks for a year and a half. He said he is affiliated with temple Oheb Shalom in Baltimore but is presently committed to helping his fellow residents with the weekly Sabbath services at North Oaks. I asked Fisher what Kol Nidre personally means to him? I also asked Fisher what it meant to have Kol Nidre chanted at North Oaks? Polsky had told me earlier that the residents would do a special Yizkor service as part of their regular Shabbas worship on Saturday. 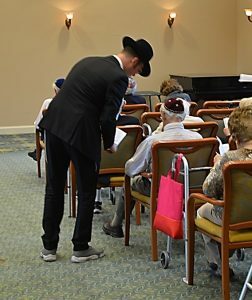 “We actually came together to create our own Yizkor service and include the names of all of the residents who have died since we last said the memorial prayer,” said Polsky. Fisher excused himself for a moment to set up the podium mic. He paused briefly as he unraveled the chord and wondered aloud if the student rabbis would even use it? Ner Israel is Orthodox, he informed me, and in the Orthodox tradition the use of a mic on Kol Nidre might be forbidden. 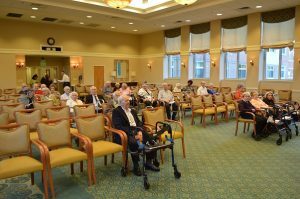 North Oaks residents await the arrival of the rabbinic students from Ner Israel. (Anthony C. Hayes. One-by-one, the community residents – many using walkers or other support aides – started to filter into the meeting hall. Several were attended by brightly-dressed nurses. One woman brought her daughter along. Moses said that while she doesn’t always make it down for the weekly Shabbas services, she does try. So does Marion Ripps, who, along with her son Lenny, attended the Friday evening service. Mrs. Ripps, a member of Baltimore Hebrew Congregation, has lived at North Oaks for three years. Lenny, a 60-ish comedy writer and producer from Los Angeles, admitted that, even though he is not a particularly religious man, he sees a much larger picture in the modest meeting. At about 5:30, seven rabbinic students from Ner Israel arrived. All were wearing dark suits and large-brimmed, black Borsolino hats. Their fringed tzitzit could be seen peeking just beneath their suit jackets. Though Orthodox, the services the students lead at North Oaks are a blend – more Modern Orthodox or Conservative in nature with just a touch of the Reformed tradition. Yarmulkes are available for those who did not bring their own, but not all of the men wear them. Women may sit with the men, and allowances are made for the aches of the aging population. No one was asked to stand for any of the prayers – a normal practice in Judaism. To the contrary – the students did their best to make sure all of those in attendance were comfortably settled and had a prayer book in hand. “On a simple level, Kol Nidre is a piece – a paragraph where we make the declarations: That all our vows should be null and void. That they should not be binding. “But there is a deeper interpretation to the Kol Nidre service. Turning to the prayer book, a student chazzan (cantor) recited Kol Nidre three times – each time louder than before. The congregation chanted along with the cantor in a grievous undertone, repeating the ancient Aramaic prayer. 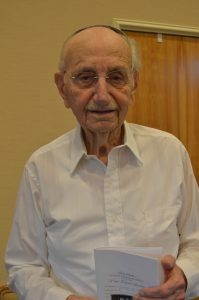 As the chazzan continued chanting additional prayers throughout the hour-long service, his fellow students kept a weather-eye on the residents – helping them find the right page in their prayer book, and offering brief explanations of the text to anyone who asked. One student to my left hovered near a grey-haired man in a plaid sport shirt. He stepped forward at least twice to help guide a young nursing aide, who was attending the service with an infirm resident. On the right side of the congregation, another student spotted a man seated along the center aisle. The bespectacled resident was thumbing his prayer book and appeared to be somewhat lost. The student quietly moved around the room, walked up the aisle and paused at the mans side. Without saying a word, he leaned slightly over and then gently ran his finger across the page – effectively bringing the appreciative resident up to speed. When the service was over, it was difficult to ascertain which group came away more greatly blessed: the young scholars – who smiled broadly as they helped several shaky residents stand, or the aged congregation – many dabbing tears from their eyes as they thanked the earnest young students. As for the congregation, one man who was visibly moved by the warmth and the attentiveness of the rabbinical students, confided that he usually sends Ner Israel a check for twenty dollars. Editor’s note: This is the eighteenth part of an ongoing series which will look at the places and people that make up the rich history and diverse nature of spirituality, belief, and observance in Baltimore and beyond. Read the series here.